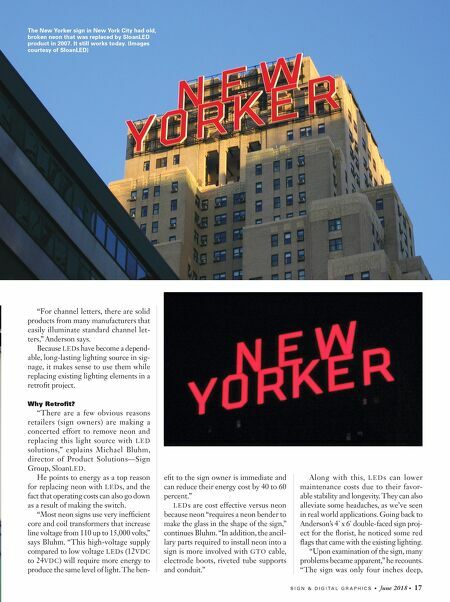 ELECTRIC SIGNAGE E L E C T R I C S I G N R E T R O F I T S Retrofits Addressing the challenges and components of retrofitted channel letter projects B Y R Y A N F U G L E R Ryan Fugler is a free- lance writer and for- mer editor of WRAPS magazine. He can be reached at rnfugler@ gmail.com with ques- tions or comments. I n life, things aren't always as they appear. Sometimes even the most seemingly routine tasks can present challenges. Well, retrofitting a channel letter project with LEDs can also bring up some unforeseen difficulties. 16 • June 2018 • S I G N & D I G I T A L G R A P H I C S LEDs are excellent replacements for neon because of their low maintenance, versatil- ity and dependability. (Image courtesy of International Light Technologies) Non-Routine John Anderson, president of the Austin-based electric sign shop Mega Volt, Inc., recalls one specific case, "A flo- rist approached me to replace the faces in their 4' x 6' double-faced sign," he recalls. "At first, a project like this would seem like one of the most straight-forward retrofit jobs imaginable: just replace the florescent tubes with double-sided LED strips." But Anderson notes that upon a closer look, the job proved to be a much more involved process than initially determined. With signage, these kinds of examples come up regularly. Since there are so many factors involved with measuring, examining, and building the most effec- tive end-product, elements are almost certain to fluctuate as the project moves forward. 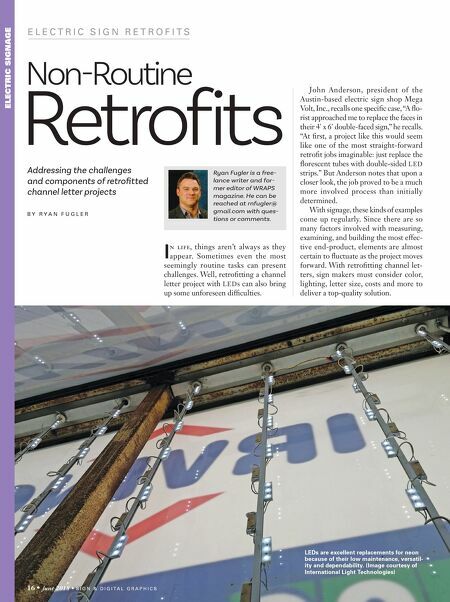 With retrofitting channel let- ters, sign makers must consider color, lighting, letter size, costs and more to deliver a top-quality solution.